Rev. Edward Pinkney of BANCO speaks at Moratorium NOW! meeting in Detroit Nov. 17, 2014. DETROIT –An announcement of Rev. Edward Pinkney’s Oct. 3 conviction by an all-white jury on five felony charges elicited wild applause and a standing ovation at a monthly Republican meeting Nov. 15 in St. Joseph, Rev. Pinkney told VOD this week. The life-long Benton Harbor activist said an individual who attended the meeting also told him that Berrien County Clerk Sharon Tyler and Sheriff L. Paul Bailey, both instrumental in concocting phony charges of “forgery under the Michigan election law” against him, were part of the merriment. 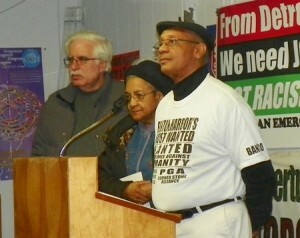 Marian Kramer of MWRO (center), flanked by Dave Sole of Moratorium NOW! and Rev. Pinkney. announces Dec. 6 strategy meeting in Detroit. He said his appeals attorneys are moving forward with motions to overturn the verdict. There was no evidence brought forward at trial to convict him of altering dates on petitions to recall Benton Harbor Mayor James Hightower, as even a Michigan State Police Forensics Technician admitted. Subsequent investigation has shown that many jurors did not disclose their ties with opposing parties in the case. Additionally, the Court of Appeals ruled Oct. 23 that violations of election law are misdemeanors, not felonies. 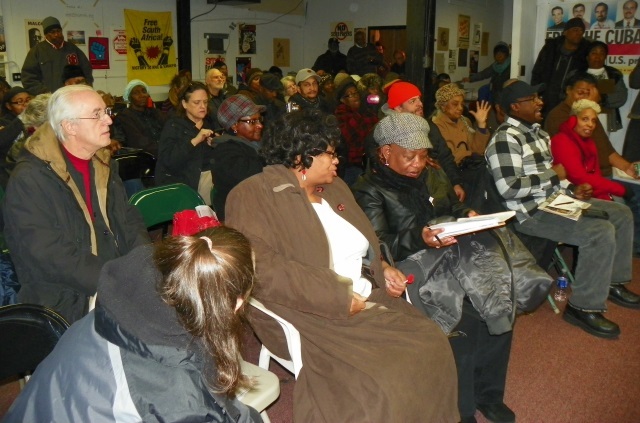 Earlier, Pinkney spoke in Detroit at Moratorium NOW’s weekly meeting Nov. 17, where Michigan Welfare Rights Organization (MWRO) leader Marian Kramer announced that a strategy meeting on Pinkney’s case will be held this coming Sat. Dec. 6 at 1 p.m. at Central Methodist Church, located at Woodward and Adams. Marcina Cole said another busload is being organized to attend the Pinkney’s sentencing in St. Joseph Dec. 15. Over $700 was raised at the meeting for his defense. 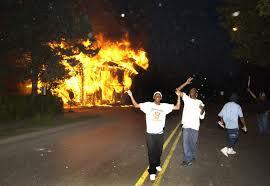 Benton Harbor rebellion against police murders, including that of Terrance Shurn, in 2003. Berrien County and Benton Harbor police carried out a mini-version of the police state that exploded after Ferguson, MO killer cop Darren Wilson shot 18-year-old Michael Brown to death Aug. 9, as he raised his hands in surrender. 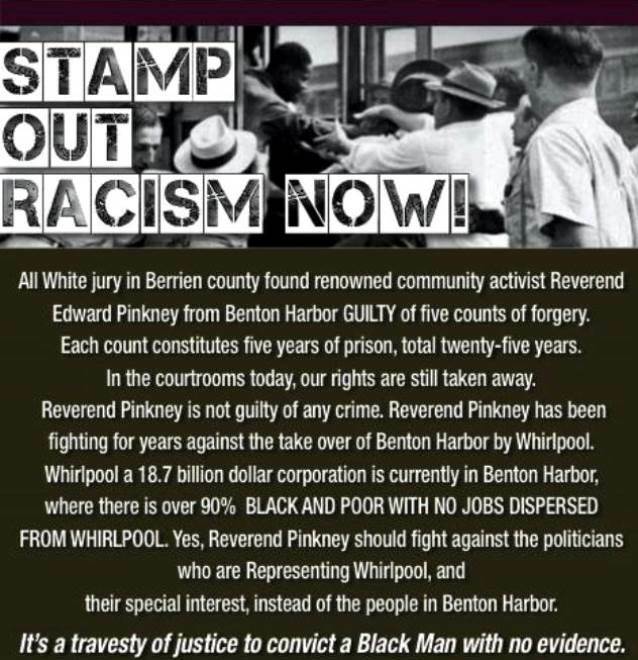 In addition to the SWAT team with tanks that raided Pinkney’s home May 24 attempt to arrest him, police from numerous districts were all over Benton Harbor knocking on doors to terrorize its 90 percent Black population, he said. 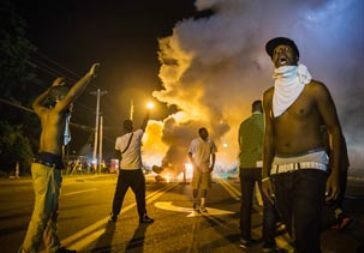 Ferguson protesters take the streets Aug. 19, 2014 against police murder of Michael Brown. Pinkney identified racism as the chief problem everywhere today in the U.S., a view that was recently confirmed by a report from the United Nations Committee on Torture. Quincy Stewart and another man from Pontiac, Michigan told the audience the travails that residents of their city have suffered since an Emergency Manager took over as has been done only in majority-Black cities across Michigan, including Benton Harbor and Detroit. Judge Sterling Schrock, who is to sentence Pinkney. Oakland County, a majority white, is one of the wealthiest counties in the U.S. Oakland and Macomb Counties were two of only four counties, out of 83 in Michigan, that voted against a referendum to repeal the first Emergency Manager law, Public Act 4. Pinkney asked his supporters to write letters to Berrien County Judge Sterling Schrock demanding to know how he could be convicted with no evidence. Schrock’s address is 811 Port St. St Joseph, MI 49085. BANCO targeted Schrock in 2011 for his racially discriminatory murder sentencings of a white man to probation, and three Black youths to prison for life. Click on Sterling Schrock legacy of hatred to read story. Rev. 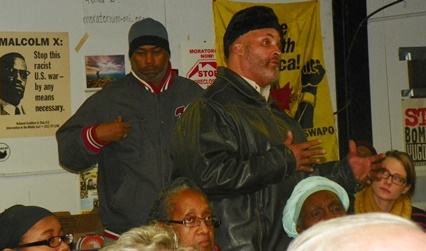 Pinkney’s wife Dorothy Pinkney is in front row, with grey hat, during meeting Nov. 17 in Detroit. Gail Freehling, former city clerk for New Buffalo, MI was on Pinkney jury. Sharon Tyler, the Berrien County Clerk who oversees all city clerks there, was one of chief witnesses against Rev. Pinkney. The look in her eyes, the expression on her face – if her eyes could shoot I would be dead. How much hate can one person have in their heart? Gail Freehling is the type who would be responsible for mobbing, hanging, and shooting blacks for no reason. Racism in the 1960’s: it was a huge decade and a war/battle every day between Blacks and Whites. Black and Whites had different drinking fountains and wash rooms. Whites in Mississippi would scare blacks into leaving town by putting up signs, burning crosses, burning homes, and killing all members of the family. On October 27, 2014 in Berrien County, Michigan an all-white jury was sitting in judgment of me. The jury was motivated by something other than the truth. 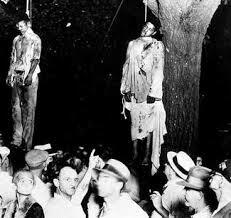 Marion, Indiana, Aug. 7, 1930: Thomas Shipp and Abram Smith are lynched. I was found guilty with no evidence and no witnesses to testify against me, no confession, and a group of whites hating black people. In the Berrien County courthouse this was a modern day lynching. In 1960 they wore white robes and masks to symbolize their color and to sometimes act like ghosts. Today they wear suits, ties, and black robes to symbolize their color. We must not forget our friendly American police officers whose job is to serve and protect -and have murdered someone every single day of the year. 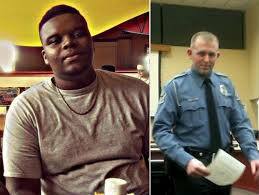 Mike Brown, 18, of Ferguson, MO, and his executioner KKKop Darren Wilson. To sign up for bus to Rev. Pinkney’s sentencing in St. Joseph, Dec. 15 at 8 am, contact Marcina Cole at 248-383-3595, or Abayomi Azikiwe at 313-671-3714. 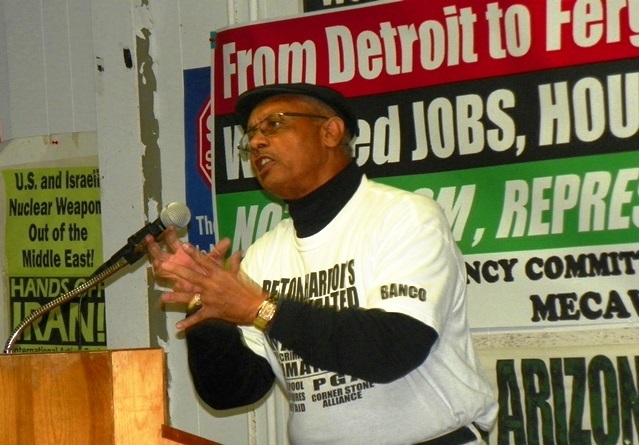 “Reverend” Pinkney has to hold a rally in Detroit because all of us here black and white are sick of his crap. When Jessie Jackson steps away from you as a black activist…that speaks volumes……. The Slow Takeover Of Government By Big Business !! THE REPUBLICANS ARE MAKING IT VERY DIFFICULT TO EXPLAIN THE TRUE DEFINITION OF ***DEMOCRACY*** TO “THE NEXT GENERATION” ?? ?